The tablet is out of the bag over at Asus thanks to the Taiwanese firm's own doing. Thanks, Asus. Makes our job a whole lot easier. 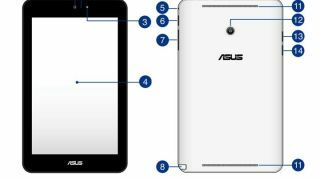 Though it's still awaiting official announcement, a manual published on Asus' website confirms the VivoTab Note 8 is in the offing. We've heard about the Windows 8.1 tablet before, but this is our first official peep at its design as well as a nod to some of the machine's specs. Model-numbered M80TA, there's no word on when the VivoTab Note 8 will hit the market or how much it will cost, but chances are we're in for a device around $300 (about £182, AU$336). Chief among the new tab's features is a pen slot, meaning this machine will pack a scribbler when it launches. The manual noted that "the bundled stylus pen allows you to input commands on your VivoTab Note 8." Though it takes a cue from the Dell Venue 8 Pro with a side-fixed Windows button, that device doesn't come carrying a stylus. With the VivoTab Note 8, we're also in for front and rear cameras (though no megapixel numbers were provided), a microSD slot, and the absence of an HDMI or other video output channel. Thanks to an earlier FCC filing, we know the new VivoTab will sport an 8-inch 1280 x 800 IPS display, 2GB of RAM and come in 32GB and 64GB flavors. It should be chipped with an Intel Atom Z3740 quad-core CPU. Is there a chance we could see the VivoTab Note 8 in the flesh at CES 2014? We'd say most definitely. Know what else we're in for at CES? New ZTE phones, that's what.